Congratulations to Leonard Martin, Event #49: $2,500 2-7 Triple Draw Lowball (Limit) Champion ($189,919)! Congratulations to Leonard Martin, winner of Event #49: $2,500 2-7 Triple Draw Lowball (Limit) and $189,919 in prize money. Not only that, Martin is walking away with a brand new World Series of Poker gold bracelet around his wrist. 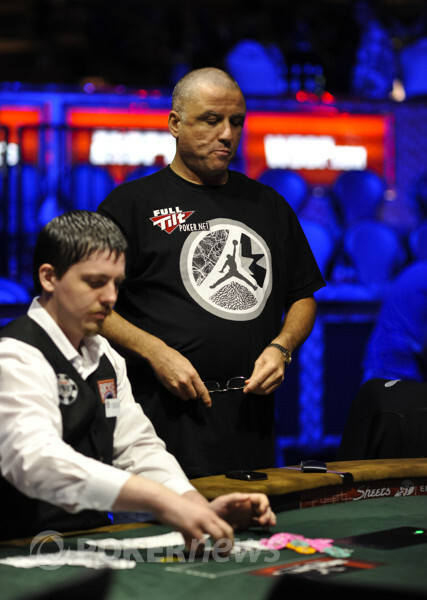 Martin held four WSOP cashes on his record prior to this one, including a second-place finish in the $1,000 Limit Deuce to Seven Triple Draw event in 2007. He was able to top that performance here and go on to take victory over Justin Bonomo. When the day began, all eyes were on Jason Mercier as he went for number two of this year's Series. 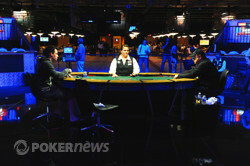 Mercier went on to finish in sixth place as he couldn't get much going at the final table. From there, Martin quietly maneuvered his way to the final three before he began to make some noise. When play got down to just two, Marin was down two-to-one in chips. He battled back to take the lead, but it took a lot more to win the event. Martin and Bonomo battled back and forth with the lead exchanging hands several times. Finally, Martin put a hurting on Bonomo and left him short. The match was over shortly after that. Congratulations to Leonard Martin for his victory in Event #49 and be sure to stay tuned to PokerNews for all of your coverage from the 2011 WSOP. Leonard Martin raised on the button and Justin Bonomo called out of the big blind. Bonomo drew two, Martin drew one, and Bonomo check-called a bet from Martin. Bonomo then drew one while Martin stood pat. 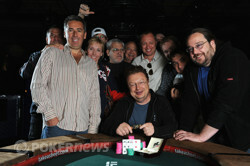 Bonomo check-raised all in for an additional 10,000 after Martin bet, and of course Martin called. Bonomo drew one and opened , while Martin stood pat and tabled . Bonomo needed to catch an , , or to survive, but it wasn't meant to be as he turned over a to finish in second place. After the first draw, both players checked to go to the second draw. Leonard Martin drew two and Justin Bonomo took the same. Martin bet and Bonomo raised. Martin called. For the third draw, Martin stood pat and Bonomo took one. Both players checked. Bonomo couldn't muster anything better than Martin's and he was knocked way back to 235,000 in chips. Justin Bonomo raised on the button and Leonard Martin reraised from the big blind. Bonomo called and both players drew two. Martin checked, Bonomo bet and Martin called. On the second draw, Martin took two and Bonomo took one. Martin checked, Bonomo bet and Martin called. For the third and final draw, each player opted for one new card. They both checked and Bonomo showed the . Martin mentioned that he had a pair and mucked his hand. Leonard Martin raised on the button and Justin Bonomo called from the big blind. Bonomo drew two and Martin drew two. Bonomo checked, Martin bet and Bonomo called. On the second draw, Bonomo took two and Martin drew one. Bonomo checked, Martin bet and Bonomo called. On the final draw, both players took one. Bonomo didn't check this time, he led with a bet. Martin called. Bonomo showed a ten-nine, but Martin's was the winner and he scooped the pot. Leonard Martin has just pulled things back a bit and is much closer to even now with Justin Bonomo. First, he made an eighty-seven against Bonomo and then his was a winner. Martin's back to a million in chips now. 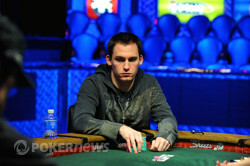 Justin Bonomo just extended his lead even further by showing down a smooth eight to beat Leonard Martin in another pot. Leonard Martin raised from the button and Justin Bonomo reraised from the big blind. Martin made the call. Bonomo took two and Martin did the same. Bonomo bet, Martin raised and Bonomo called. On the second draw, Bonomo drew one and Martin stood bat. Bonomo checked, Martin bet and Bonomo raised. Martin called. On the final draw, both players stood pat. Bonomo bet and Martin called. Bonomo showed an and Martin mucked. Back to two-to-one for Bonomo. Eli Elezra out in 5th.